We woke up early ready for another packed day. 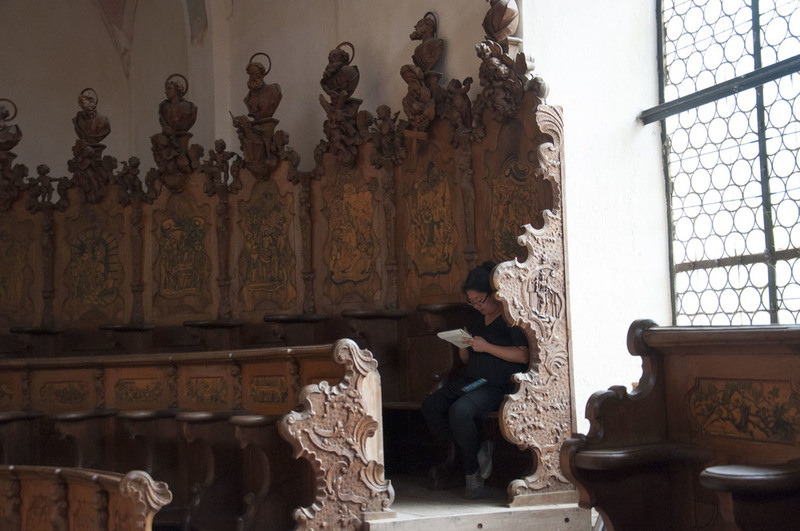 There was a long day of driving ahead of us since we were leaving the Stuttgart/Tübingen area where we had been staying for the first leg of our trip and traveling to Leipzig where we would be until Monday. 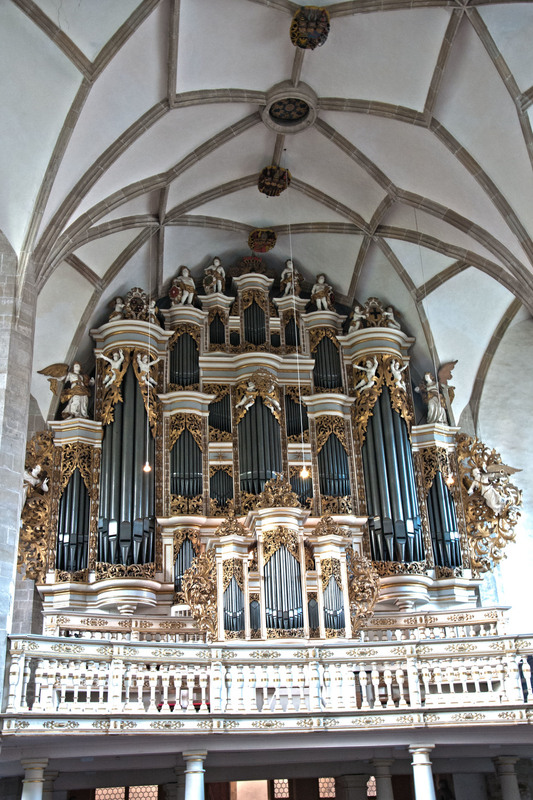 Along the way, we would stop to play organs in Maihingen and Merseburg. After eating some yummy omelets that Noel made for us, we piled into our cars with our luggage and set off early in the morning. 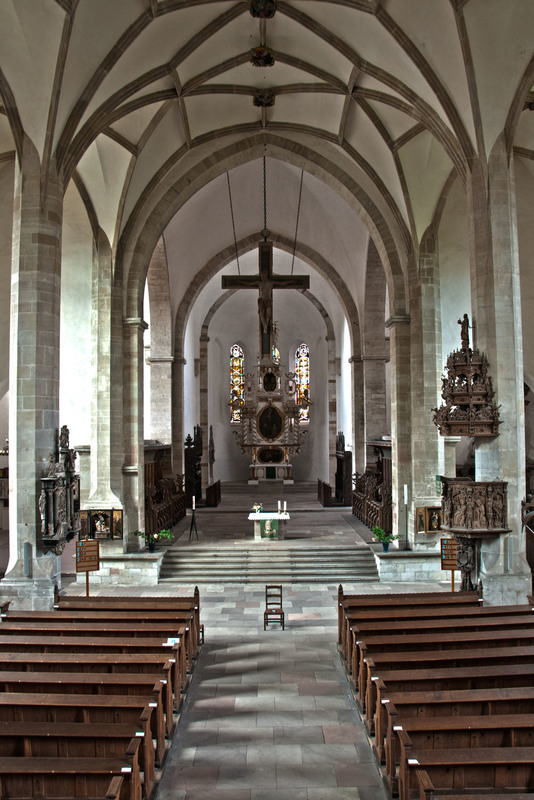 We drove through some charming German villages and saw some beautiful German countryside and forest along the way. At one point during the first leg of our trip, Gianmarco amazed us all with his ability to communicate with sheep. 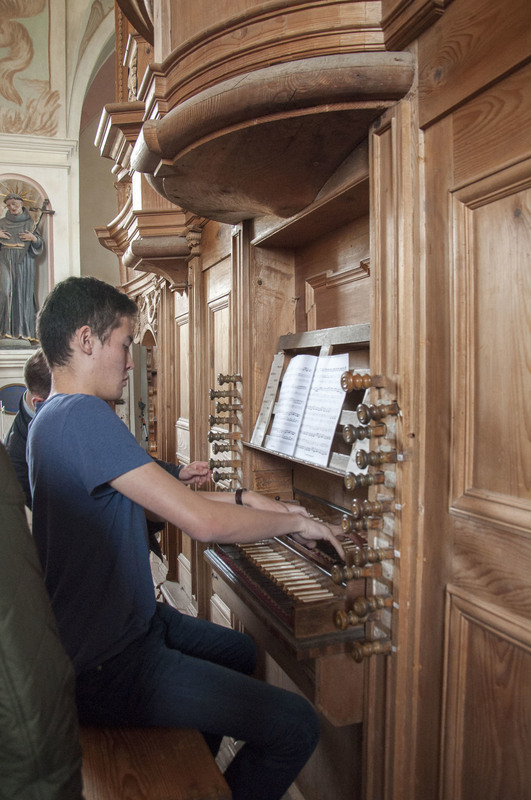 Our first stop was in the Bavarian countryside at the Baumeister Organ in the Klosterkirche (church) of Maihingen. 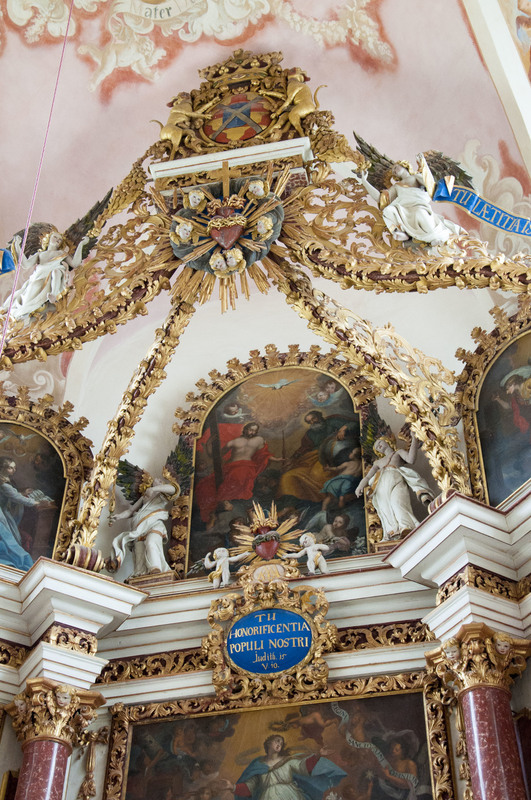 Stepping into the church, we admired the beautifully and intricately decorated interior, whose walls were painted in pastel colors. 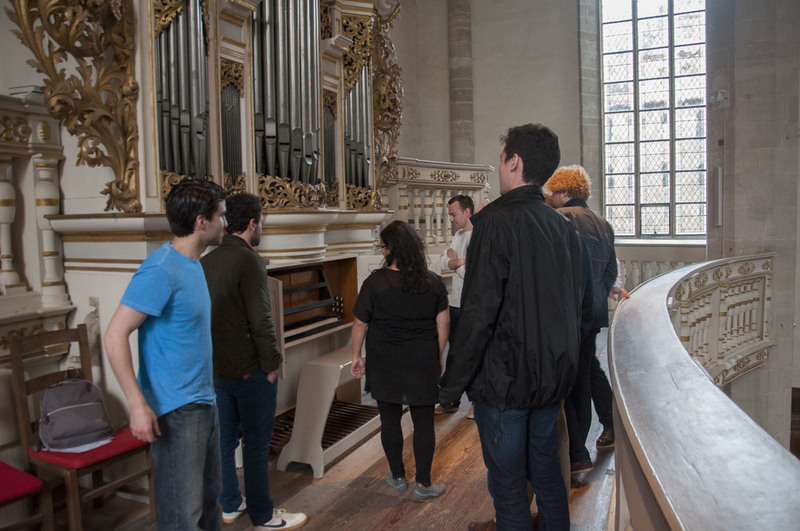 Our hosts were Herr and Frau Seiffert, who warmly greeted us at the church, showed us the organ, and let us have free rein on it for several hours. 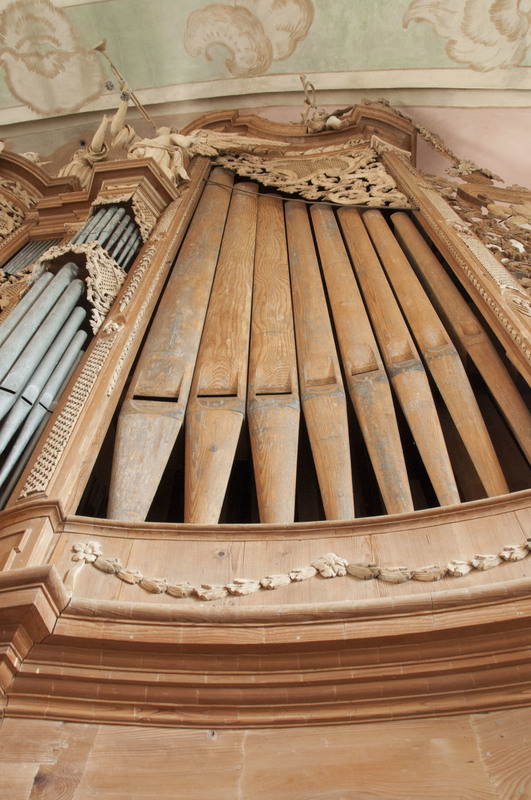 The wooden pedal pipes that were in the façade of the organ were particularly striking, since façade pipes are usually made of metal. 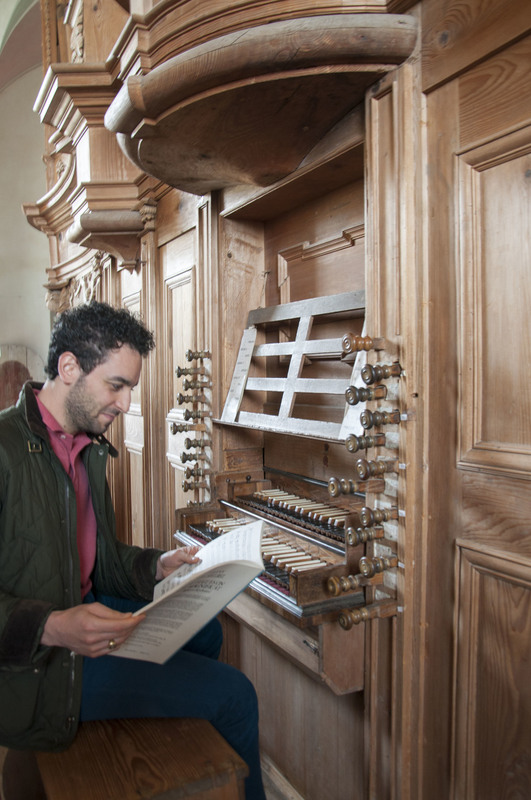 This two-manual organ is ideal for Southern German baroque music, which includes composers such as Pachelbel and Muffat. 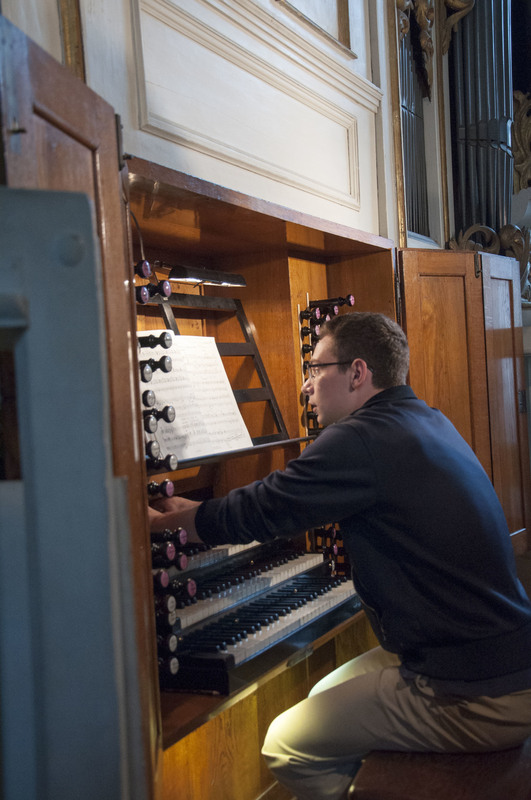 Chris demonstrated the organ’s meantone tuning, which was particularly noticeable with certain keys. 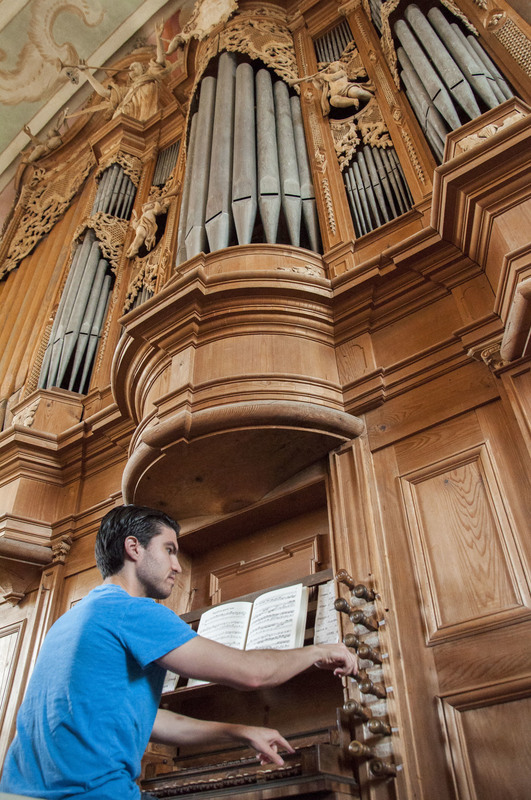 Some sounded beautifully in-tune on this organ and others sounded out of tune and thus angsty. 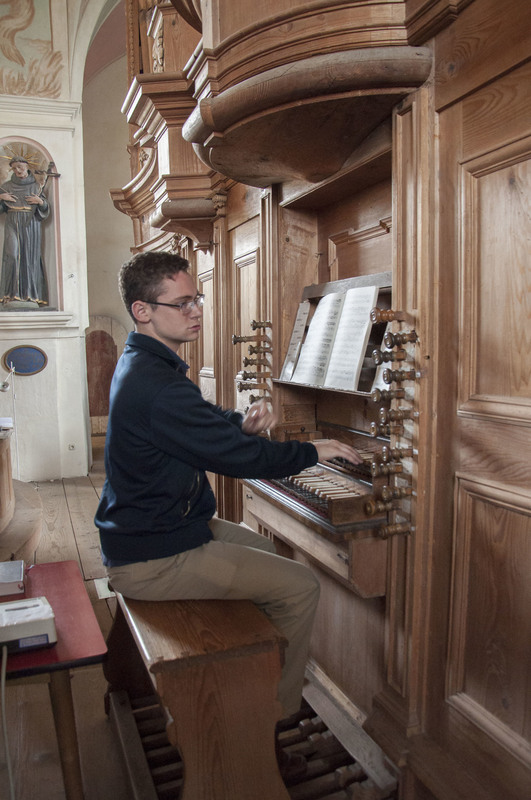 This was the case when we heard Noel perform the Pachelbel Ciacona in F minor. 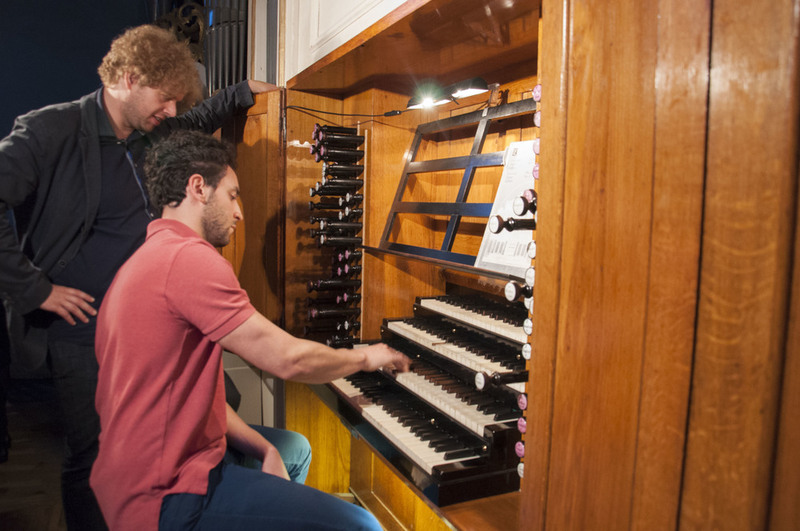 A short octave at the bottom of both manuals and the pedal made reaching intervals such as tenths much easier. This elucidated why Muffat often requires the left hand to reach tenths; a short octave makes this much easier to do. 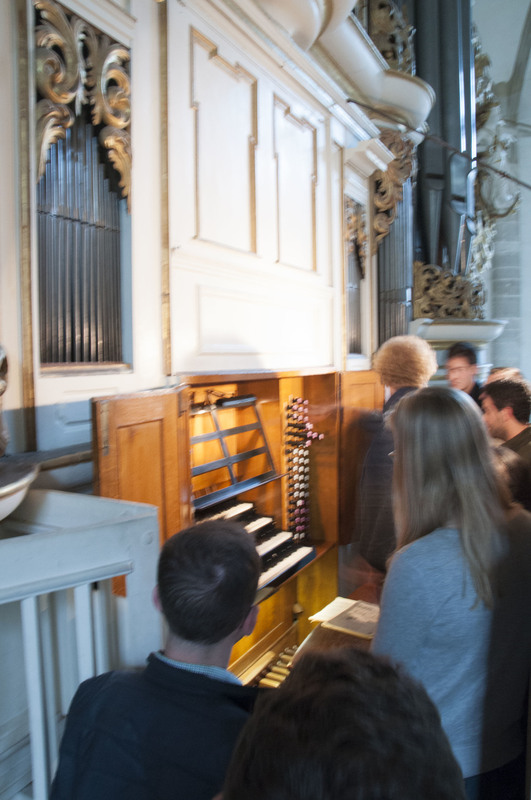 We marveled at the particularly beautiful sounds of the flutes as we each took our turn playing on the organ. 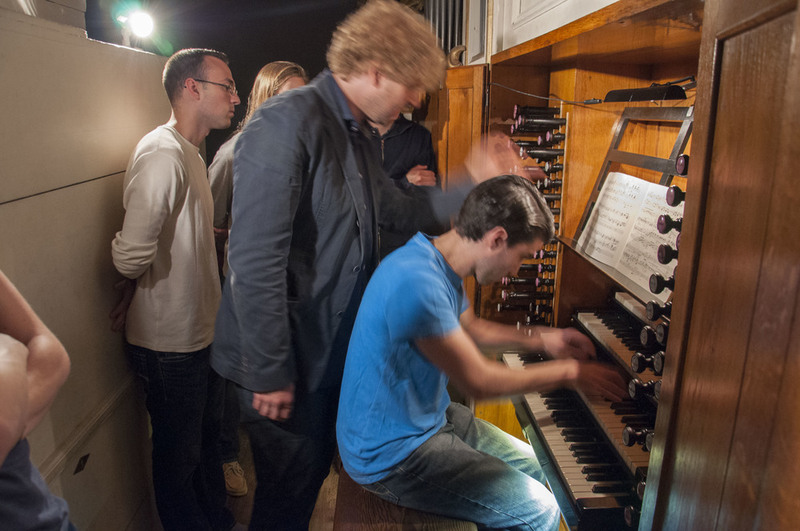 Christian Lane plays the Baumeister Organ! 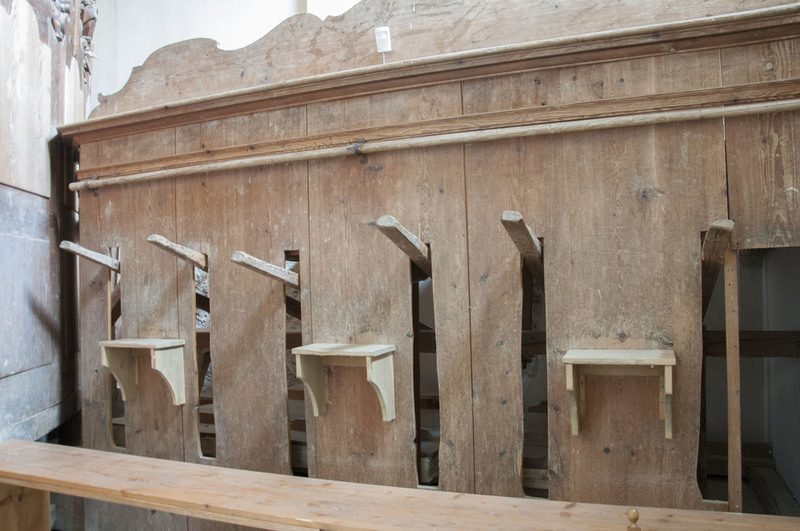 Although the organ is now connected to electric blowers that supply air to the pipes, it is still also possible to manually pump wind. 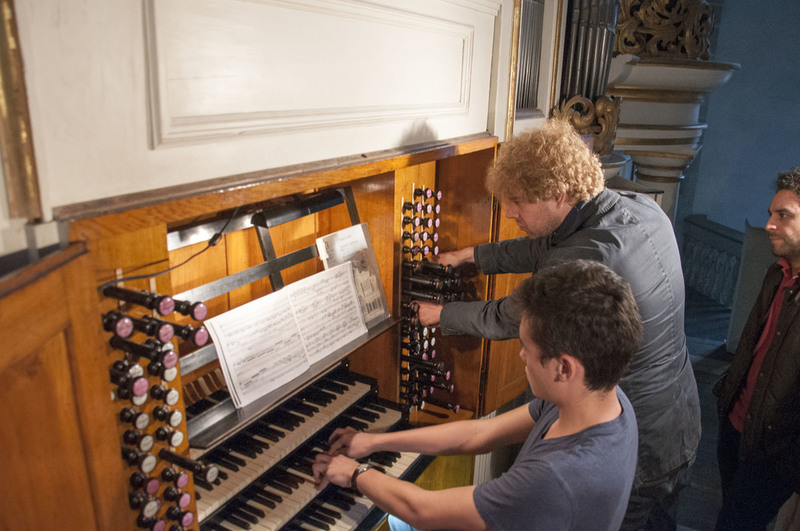 We took turns pumping the bellows adjacent to the organ, which require three people at a time to operate them. It was an excellent workout! When bidding farewell to us, the Seifferts gave each of us a thoughtful gift to take home with us: a book about the Baumeister organ. 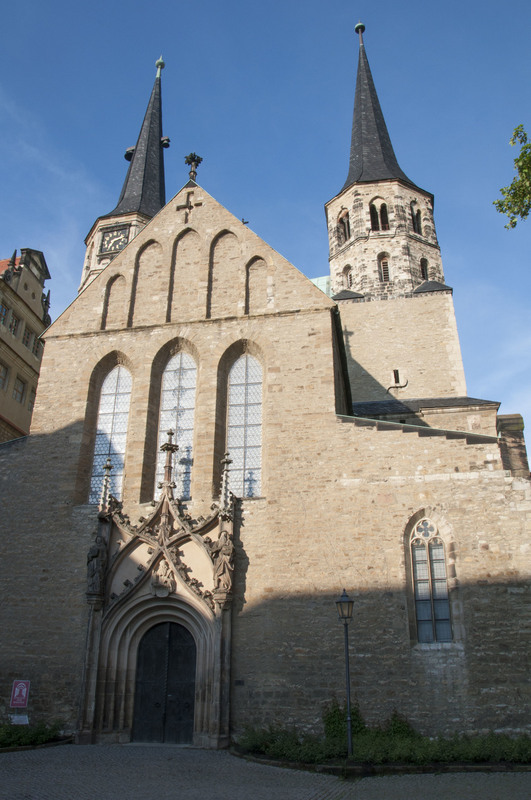 After a quick stop in Bayreuth, where we had döner kebab and drove by Wagner’s opera house, we continued to Merseburg, where the famous Ladegast organ, which Liszt had written many of his pieces for, awaited us. Our hosts, Michael Schönheit, and his assistant Denny Wilke, greeted us at the door. 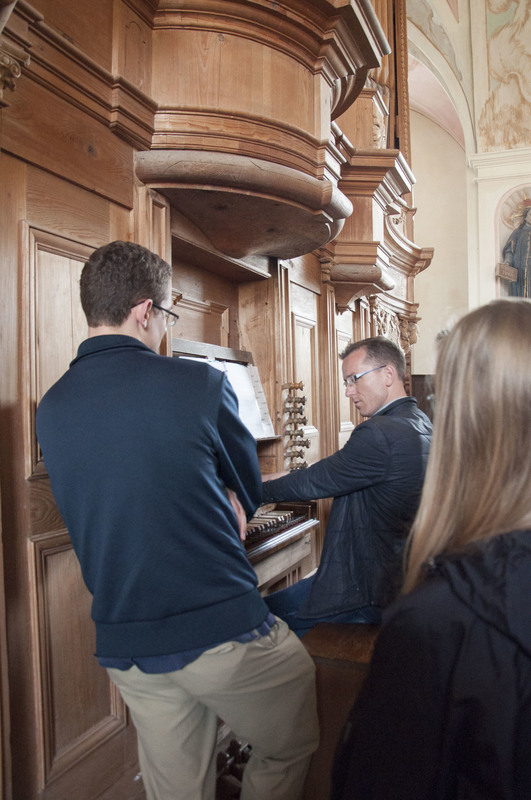 Mr. Schönheit treated us to an epic performance so that we could hear the sounds of the organ, playing Reger’s Introduktion and Passacaglia in d minor, Liszt’s Prelude and Fugue on B-A-C-H, and Bach’s Passacaglia in c minor (with authentic “orchestral” registrations for this very organ, as left to us by J. G. Töpfer). 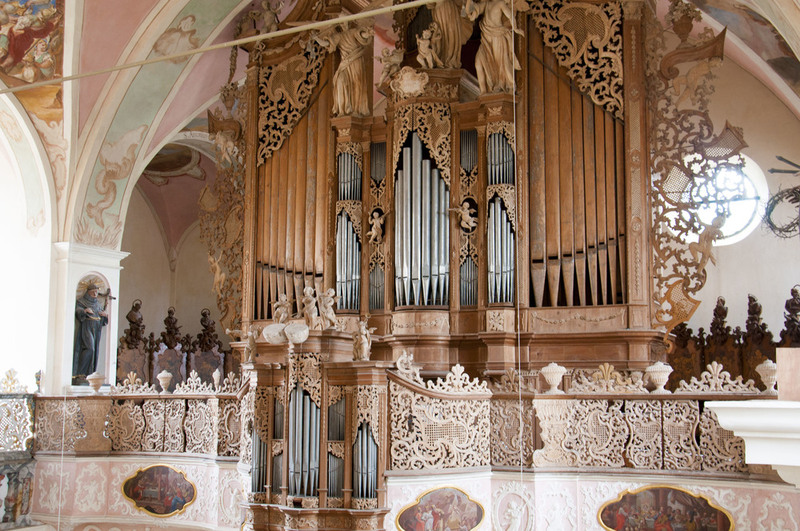 Liszt’s B-A-C-H was originally written for the inauguration of this organ, but Liszt didn’t finish writing it in time for it to be performed at the inauguration. 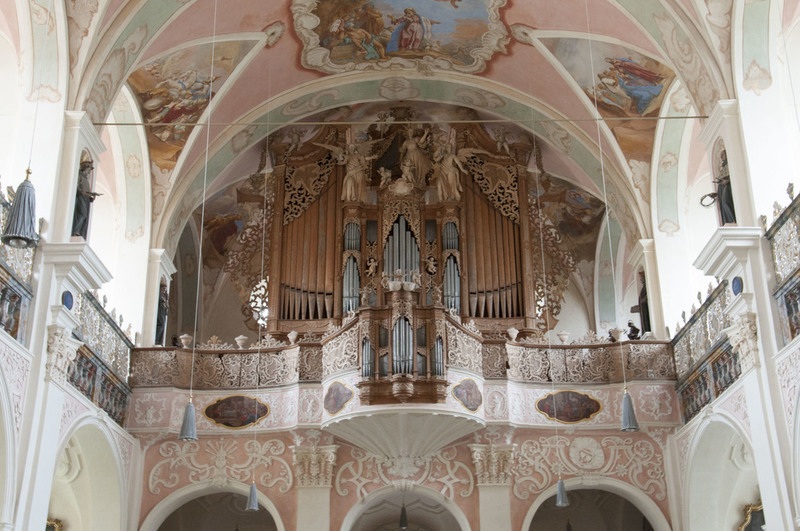 Instead, it was premiered later on this organ by his student Alexander Winterberg, with Liszt traveling to Merseburg several times to work out registration for the piece with the performer. 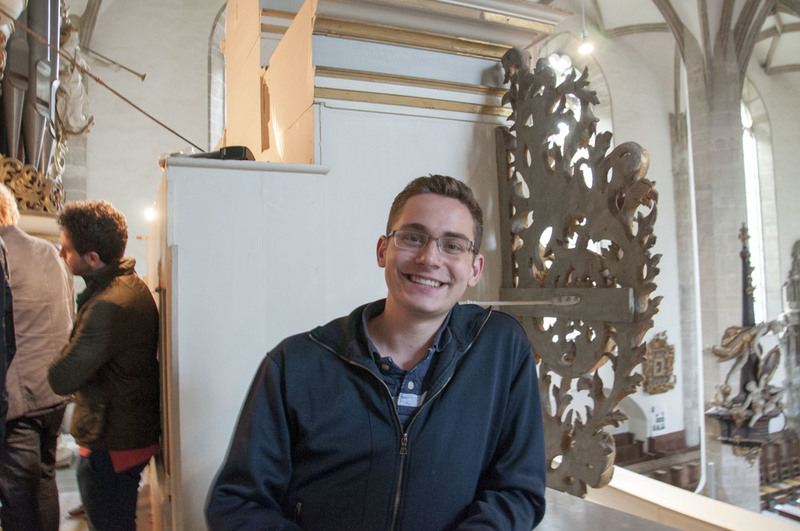 It was amazing to sit on the very same bench on which Liszt had sat and to play his Prelude and Fugue on B-A-C-H with the specific registration that he had had in mind on the very organ! 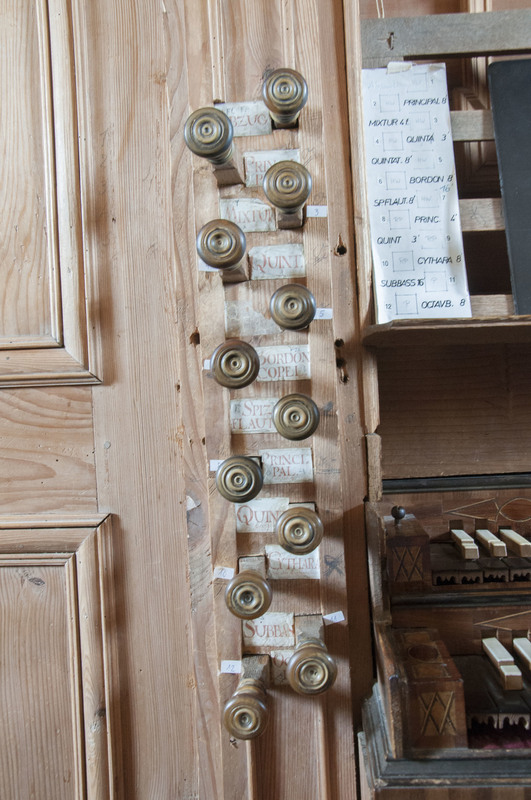 This organ has a famous Aeoline stop in its Brustwerk division, which has a specific 16’ reed sonority reminiscent of the catacombs. Liszt calls for this particular stop in B-A-C-H and it was amazing to hear the very same sounds that Liszt heard and desired for this piece. 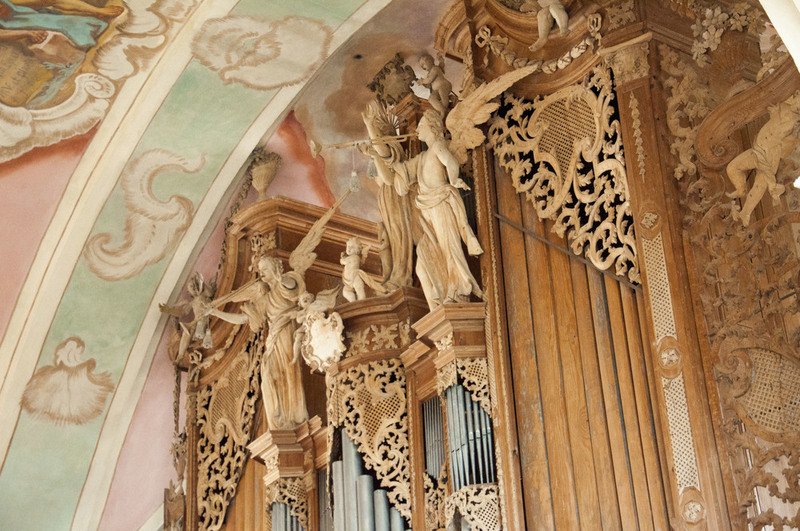 We delighted in the organ’s massive sound and its variety of beautiful colors. David and I both played Liszt’s B-A-C-H (it was played a total of 3 times in one evening! ), Laura played the famous Passacaglia from Rheinberger’s 8th Sonata, Noel played Bach A minor Prelude and Fugue (during which we were treated to some expressive interpretive dancing by David, Laura, and Kade), Gianmarco played Bach Prelude in G Major, Kade played Bach’s transcription of the Organ Concerto in G Major by Johann Ernst, and Brandon played selections from the Reubke Sonata. The beginning of the Reubke Sonata perplexingly calls for the organist to crescendo while playing with both feet at the same time. Suddenly this predicament made sense on the Ladegast, which has a stop that allows the assistant to open the swell box. 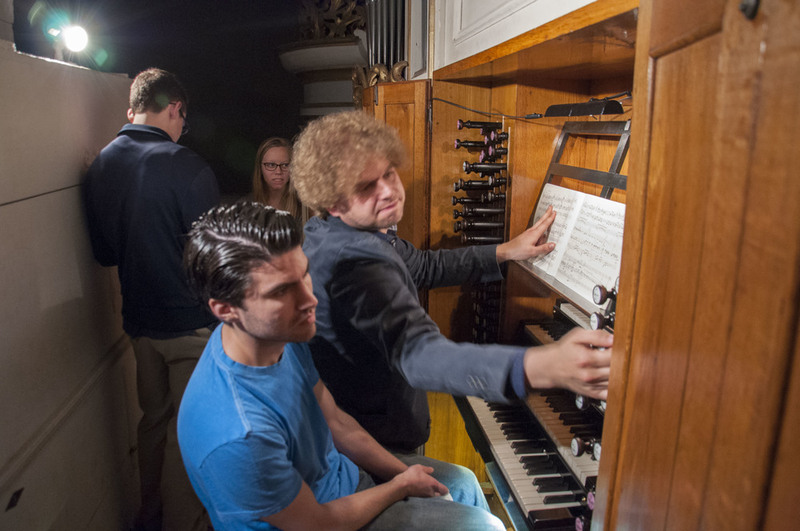 Denny Wilke stayed on to tell us about the organ and help us register for each of the pieces that we played. 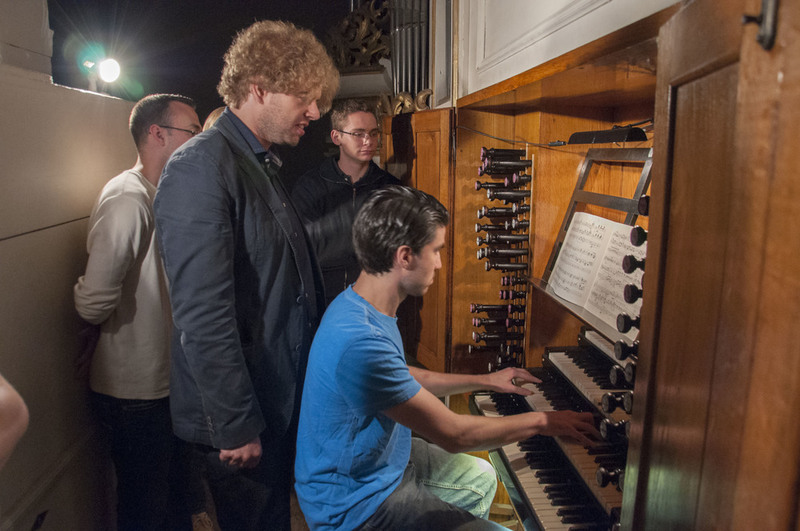 He also coached each of us and demonstrated how to work with the acoustics of the space and the incredibly heavy key action. 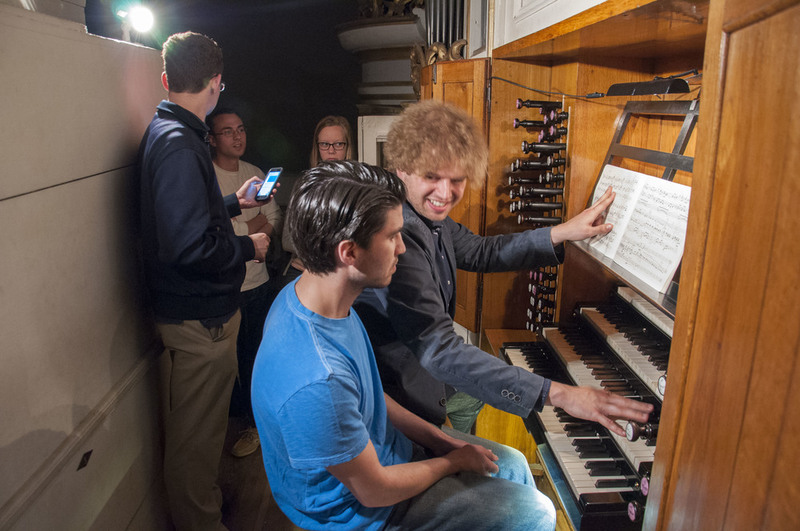 We loved Denny’s enthusiasm, energy, impressively thorough knowledge of the Ladegast organ, and his amazing playing. 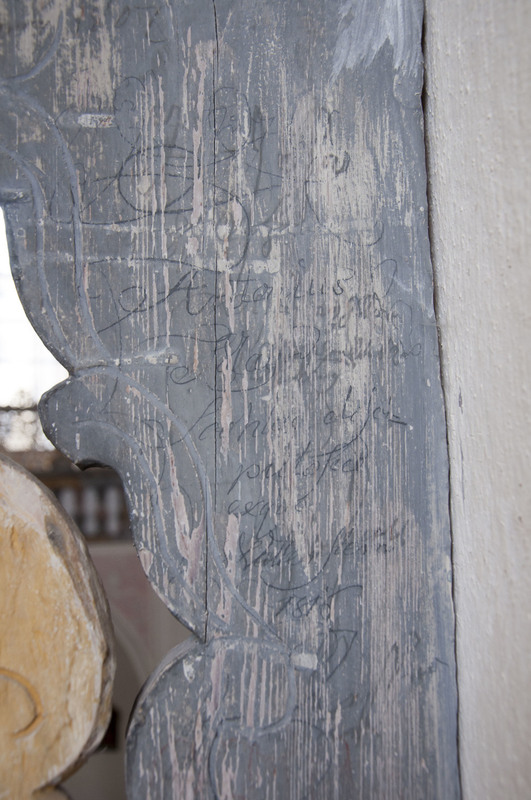 Even though we were there until after 11 p.m., I think we might have stayed there all night with him if we hadn’t had to drive to Leipzig and get to bed for an early start tomorrow. 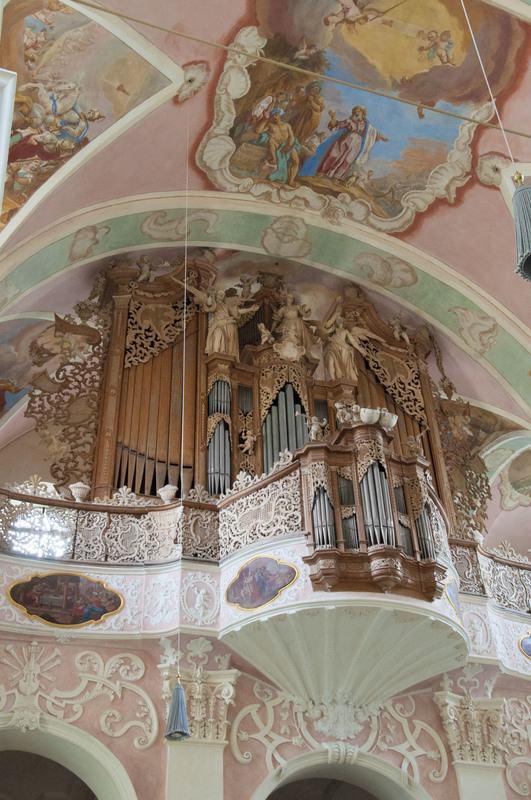 We finally arrived at our apartment in Leipzig around midnight, exhausted and thoroughly satisfied with the amazing sounds that we had heard and beautiful organs that we had played.